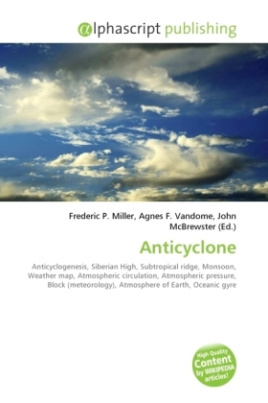 An anticyclone (that is, opposite to a cyclone) is a weather phenomenon in which there is a descending movement of the air, and with surface systems, higher than average atmospheric pressure over the part of the planet's surface. Effects of surface-based anticyclones include clearing skies as well as cooler, drier air. Fog can also form overnight within a region of higher pressure. Mid-tropospheric systems, such as the subtropical ridge, deflect tropical cyclones around their periphery and cause a temperature inversion inhibiting free convection near their center, building up surface-based haze under their base. Anticyclones aloft can form within warm core lows, such as tropical cyclones, due to descending cool air from the backside of upper troughs, such as polar highs, or from large scale sinking, such as the subtropical ridge. Anticyclonic flow spirals in a clockwise direction in the Northern Hemisphere and counter-clockwise in the Southern Hemisphere.